If you do not get our Emails ...... Go to the bottom of our Website Home Page and you can read our News Letter Emails. 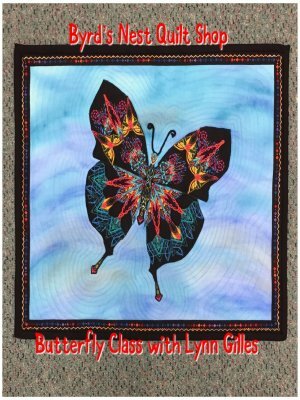 Make a beautiful butterfly from 1 yard of fabric. This class is a one yard challenge in which the participant creates a Butterfly using only one yard of a large print fabric. 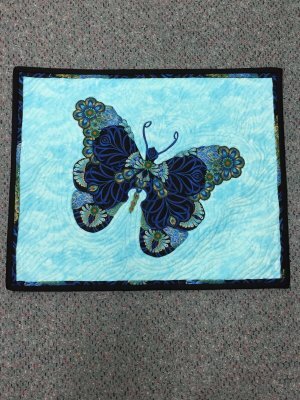 Pictures of the completed project as well as the challenge fabric used are attached. 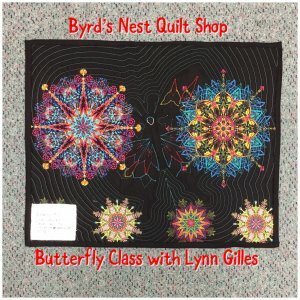 One yard of a large to very large print with motifs that would make interesting butterfly wings and body parts. 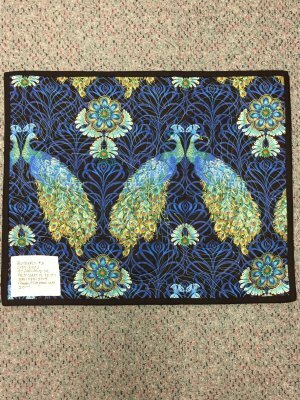 Select a fabric with value and color contrast that has more motif than solid, but still has some areas of solid or tiny print as well. The large print Must be symmetrical or a mirror image. 1 Foam Board Larger then the Fat quarter. Small Iron if you have one. Straight Pins that you can pin into the foam board. As Always Class supplies are 15% at the store. If you have questions you can always call the store. Another Butterfly that was done.